We’re pleased to present our website design mini-site with everything you need to know in one place: http://website-design.nisect.com – the text below is just an introduction. We offer a range of design/management services covering many needs and budgets, aimed at small-medium sized businesses, organisations and individuals. ‘Dynamic’ sites with any number of pages – used is you want to change the site and/or interact more with users. Content management system – an easy way for you to add/delete/change content (now HTML or programming required). These are just some features that incorporated into a website. We specialise in providing custom designed websites that use a content management system. This enables the owner to easily change and update information on their site, without the need for extra help or cost. It’s easy to do even for the non confident computer user. We can provide the training if necessary (it’s nt much hard to grasp than Microsoft Word). How much? – Not that much! Just before we start it’s important to realise that before anything is even created the cost for one year is around £50 . This is the cost of your www address (domain) and the space on a server to keep all the files (hosting). This is good value – cheaper servers are possible of course but having your website down due to another company’s poor service could cost you potential customers. If you’re expecting a huge amount of traffic large investment in hosting is advised. Unlike some other companies, you will have access to all files and passwords (although it may not be best for you to fiddle around too much). We’ll discuss future support when we meet – we think the best approach is for both parties to keep access to the website in case of emergencies. Design to your liking. Bespoke, so you don’t have to have a specific logo size, page width, generic picture etc. We can advise what we think is best, but ultimately it’s up to you. Content. We can have a go at creating it although you’ll probably want provide it in any computer document/images and we’ll get it onto the web pages). Submission to Google, Yahoo and Bing search engines. Keyword and meta tags optimised for search engines. Setting up everything on your computer and mobile devices including email. Everything to keep you going for years – you’ll only have to keep up paying the yearly fees for the domain and hosting (like everyone). This is a set of static pages and images. 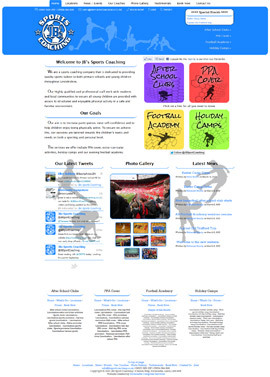 The design will be high quality, but the site is harder to update than a content managed site. Around 5 custom built web pages. 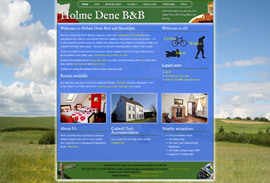 A high quality, compatible page design, in whatever style/colours you like. A reasonable number of personal images edited and styled. 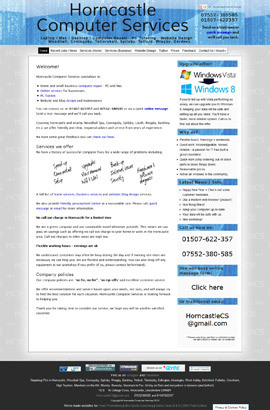 Standard website elements including a map and online message form. This is the recommended package. We’ll set up the initial site, design and content, and then you are free to update the content as and when necessary. Easy to update and manage through the content management system. Basic training in how to use the content management system – and resources to help you develop your skills further. Either of the above packages will get you a nice site. The content managed site option is recommended so you can update and change much of the content your self. Responsive design: make your website work well on phones, ipads etc. (not just one design for all screen sizes). This is especially useful when viewing a website on a mobile phone – makes the information easier to get to. Paypal integration: take payments online. Montages, frames, banners, adverts etc. Check out: http://website-design.projectc.at for all the infomation you need.